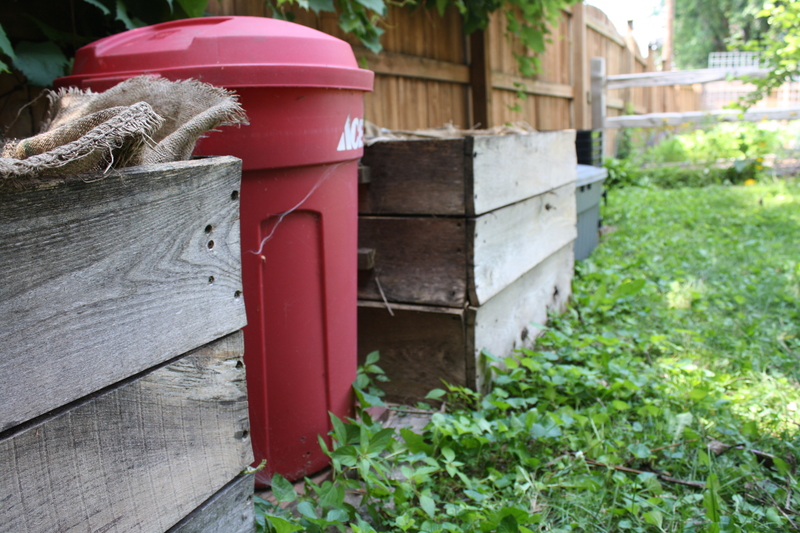 When we created our garden five years ago, we sectioned off a very small portion of our gardening space with chicken wire and created a compost pile. Since that time, our composting operation has been evolving because to be perfectly honest…it never really worked as well as we felt it should. 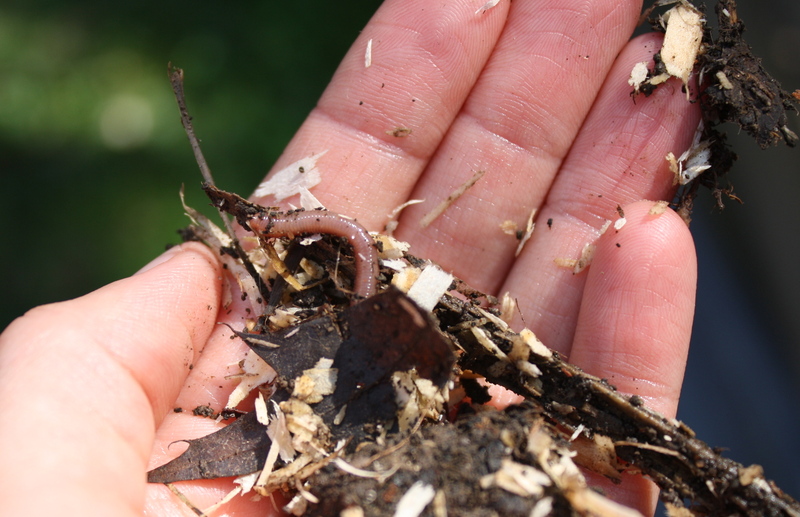 When we visited Growing Power in Milwaukee, Wisconsin a year and a half ago, we were inspired by the vermicomposting system Will Allen set up, but we were never able to get the results from our worms that he seemed to be getting. It was not until this past winter when I read Will Allen’s book Good Food Revolution, that I realized our mistake. We were overworking our worms. We were filling our vermicompost with loads of food and paper scraps and they simply were unable to keep up. While reading Allen’s book, I discovered Growing Power’s secret: Growing Power allows their collected food scraps to partially decompose first, then add the worms to the mix. Bingo. We place our compostable materials (food scraps, grass clippings, leavings, paper shred, egg cartons, coffee grounds, etc.) in the wooden boxes. (We cover our boxes with burlap just to cut down on the bugs and smell, but it still allows the compost to breath.) We try to turn this pile over every couple of weeks. Once the scraps begin to brown and break down, we move them to the red garbage can, and/or the blue plastic bin, and/or the black tower. These bins have some holes drilled on the sides for aeration, and this is where our worms are. (The black tower is an actual vermicompost bin we purchased a few years back. 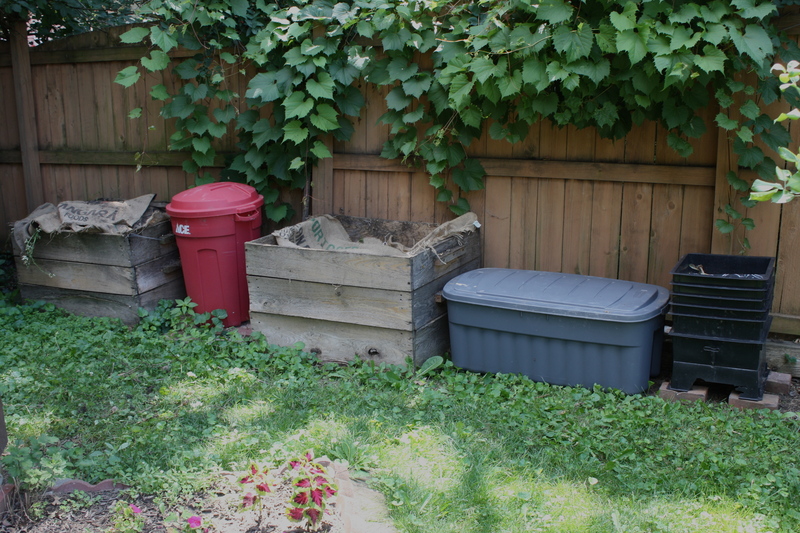 The benefit of this type of bin is that liquid can drain off the bottom and can then be used to make compost tea.) Once the worms do their work we are left with compost the consistency of coffee grounds. This compost can then be added to our garden. This entry was posted in Gardening, Holistic Living, Sustainable Living and tagged backyard, compost, composting, DIY, eco friendly, farmer, food, garden, gardening, gardens, Good Food Revolution, growing, growing power, harvest, holistic, holistic living, home, homemade, homemaker, homemaking, make, making, mama, mom, mother, organic, sustainable, sustainable living, vermicompost, Will Allen, worm, worm compost, worm composting, worms. Bookmark the permalink. WOW…that is some system you have there!! I need to show this to my husband! All we have is a huge wooden fenced in area behind our shed with 3 sections in it. I know Steve does turn the compost over and moves it around but I guess I should take a better interest in how it all works. He does put ours in the garden in the fall and we keep it going year round. However, we don’t have any worms! Thanks for all the info.